[for 2015 only] For an ice cream enthusiast such as myself, what's better than waking up to pictures of new ice cream in your email? Come on, it sure beats bills and spam. Big thanks to Miguel for sending over a picture of something he found in NYC. I did a quick internet search and found the announcement video here. It says the official release date is February 2015 and that there will be at least three other flavors that combine small shop expertise with Haagen-Dazs experience. It's a great idea and all the participants seem psyched to be part of the program. Unfortunately that's all we have at the moment, but thanks to Miguel for the tres leches picture because now we know to look for. So, are you excited to see H-D branch off like this? I am! Update: Big thanks to everyone who has been sharing their initial impressions with us! Yet Another Update: Haagen-Dazs Applewood Smoked Caramel Almond Ice Cream is listed as a "regional" thing.... which I've found in Mass on 3/25, not sure where else it will be. It's smoked applewood caramel sauce swirled into a sweet cream ice cream (collaboration with praline patisserie). My positive review is here. I am especially excited to see new and tasty ideas especially the ginger molasses and banana rum! I found the tres leches flavor at Target this morning (was searching for the B&J peanut butter cookie core). I got it because I LOVE tres leeches. Tries it, even though it was too early for ice cream - but it was so nice and melty, and it tasted like a fudge swirl ice cream - nothing special. I'm pretty bummed. Did not like tres leches. Very boring. Nothing unique about it. I have not noticed this in the stores yet, but plan to try the tres lesches and ginger molasses. Thanks for the mentioning it. I found both the tres leches and the spiced pecan turtle at target yesterday... I chose the spiced pecan to try first. It's a very interesting treat- the spice is actually a hot spicy and gets you after you swallow it. I like it- but it's almost too hot. I have a different question and didn't know where to post it. My local Dunkin Donuts has a sign up announcing that the flavor of the month for March will be call "Snacknado". Any idea what it's going to be?!?! I am highly intrigued! Marvo might know over at The Impulsive Buy or maybe even the guys at Grub Grade. You can find their links on the right side of this blog. I am very excited to see these, just hope my local grocery store gets them. I notice several comments from posters finding these at Target but I"m an hour away from one. I am hopeful that the ginger molasses might have a gingerbread/oatmeal cookie taste. Stoill can't find any of the new B&J's cores. The tres leches flavor is literally indistinguishable from chocolate swirl vanilla ice-cream. It was SO disappointing, I can't believe they even released it. It would have been more interesting if they used their dulce de leche flavor and put brigadeiro cookies in it. LM Gold, have you found them around us yet? I have mixed feelings about the Spice Pecan Turtle. First it was not what I expected. The chocolate ice cream was very good. I also enjoyed the spiced pecan which had a nice little kick which was surprising. The combination of the two really didn't go well together to me. It felt like something was missing to tie in all the flavors together. I am a big fan of Haagen Dazs but this was not one of my favorite from them. I would like for them to do another combination with the spiced pecan. 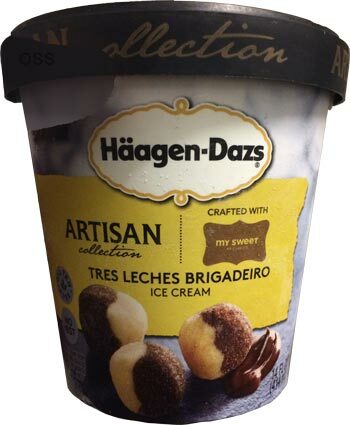 I work for Nestle ( We distribute Haagen-Dazs) in the Massachusetts area and we Have just started to receive quantity's Of the Artisan flavors. So far they are only authorized at Target. But we are planning to get them authorized everywhere. Many people are already asking for them like crazy. I have not tried them yet but I plan to. I knew I should have stopped at Target on the way home! I tried the Spiced Turtle Pecan and thought it was amazing! Did you ever have hot chocolate (like Cosi's) where they add a bit of spice to make it hot and to bring out the chocolate? It was like that, but also with salty caramel and chocolate covered pecans. The ice cream itself is heavenly! Perfect! I found the Tres Leches at Keyfood. It's not the best thing ever, but it's very clean and I liked it. I'm eating the Spiced Pecan Turtle. As stated before the two flavors are foreign together. The spiced chocolate has little if no place in rich chocolate ice cream.Those are the only two flavor discernable. It is offensive.I wish I would have gotten carmel cone instead. 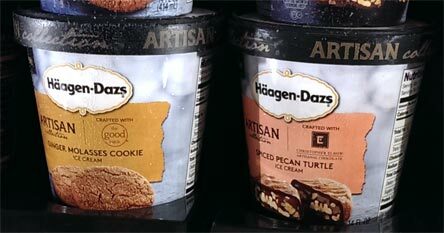 Haagzen Dazs is usually my favorite because all the flavors are so rich and pure. But the tres leches is terrible.. literally tastes like hershey syrup to me. Cloying. I just tried the spiced pecan turtle and it was awful. I had to throw it out. I tried the banana one a few days ago, and it was OK, but nothing special. I was expecting a swirl or banana pieces or something, but it was all blended together. I notice I'm not the only reviewer who threw out the Spiced Pecan Turtle. The spices clashed with the chocolate ice cream, and the result tasted nothing like a "turtle" candy. The name is misleading, and I'm surprised they even released this flavor under any name. What a flop. I did not like any of the new flavors especially that spiced turtle which spice is not identified but truly awful. I miss the green tea which was discontinued in favor of all the new flavors that I hate. HD is the only ice cream I ever have. Me too!! I couldn't find anything on the label tho. Nobody believed me when I said it burned my tongue!! I tried tres leches & AM IN LOVE W IT!!! Its the best Ice cream ever. I have bought all the pints of it at my wawa and now we r out =( I need more! Its by far the best out of the three flavors from this collection that I tried. Banana rum jam was alright. Tastes like banana and rum raisin together. Tried spiced pecan turtle. Its haagen daz chocolate ice cream w caramel swirls and tastes like chai too. Its ok. I am so sad to read that most people don't like tres leches! Me, and my two friends who tried it are hooked on it. The "vanilla" tastes more like sweet cream from cold stone and the chocolate swirls are so rich u can't compare it to regular chocolate! If u haven't tried it yet, please do!! Just tried the spice pecan turtle and I personally didn't like it and was very disappointed and now a bit skeptical to try the rest based on reviews that I've read. Haagen Dazs isn't really what it use to be lesson learned I'll stick to Ben and Jerry's cause I've never been disappointed. I've tried three of them. The Tres Leches had no flavor at all. The Banana Rum didn't have nearly enough of either flavor (I was expecting Chunky Monkey meets the rum-based equivalent of Black Cherry Amaretto or Bourbon Pecan Praline). But the Spiced Pecan was excellent. Those of you throwing it out because of the spiciness, you realize that's all in the turtle pieces, and if you eat around them, it's just plain chocolate ice cream. What a waste. Ok, I don't usually post, but after reading the last one I had to. I'm actually eating the Spiced Pecan Turtle right now. It is literally so bad I had to see what everyone else was saying. To the person that thinks everyone can just eat around the actual pecans to avoid the disgusting spice flavor... You sir are crazy! It's not just the pecans, that is the actual flavor of the ice cream that is burning my tongue and throat right now. Only eat this if you are fans of ancho and chipotle peppers or cinnamon, because that is what that unique flavor is. I honestly thought it was just crap loads of ginger. Not a fan!